2005-P Kansas State Quarter Struck through Error with IN GOD WE RUST. Image Copyright: © 2016 James Bucki; All rights reserved. The State Quarters program is noteworthy for many reasons, but perhaps the most interesting to U.S. coin collectors is the number of error coins that have appeared in the State Quarter series. The coin featured here is an example of the struck through grease or filled die error type. Looking at the image, you can see that the first "T" in "TRUST" seems to be missing, rendering a legend that says, "In God We Rust." If you look real closely, though, you can see a faint outline of the T. In the second image, I have tilted the coin a little differently to the light so you can see the T better. The third image is of the reverse side, showing that this error occurs on the 2005-P Kansas state quarter and can still be found in circulation. Why is the "T" Missing? Like all mechanical machines, a lubricant is needed in the coin press to prevent the metal parts from causing friction to each other. In this case, some lubricating grease escaped from the machinery onto the surface of the coin die, eventually plugging up the letter T in TRUST. With the T being plugged, when the coin dies struck the planchet, the T wasn't fully transferred to the surface of the coin. This type of error is called a struck through grease filled die (or just "filled die") error. Is the Struck Through Grease Filled Die Error Common? Actually, yes, this kind of thing happens fairly often. What isn't so common is the fact that it happened in such an interesting place, actually changing the meaning of an important motto on the coin. Sometimes, whole words get obliterated because of a filled die! In fact, there are cases of the entire surface of the coin coming out all mushy-looking, or very lightly struck, because of excessive grease. 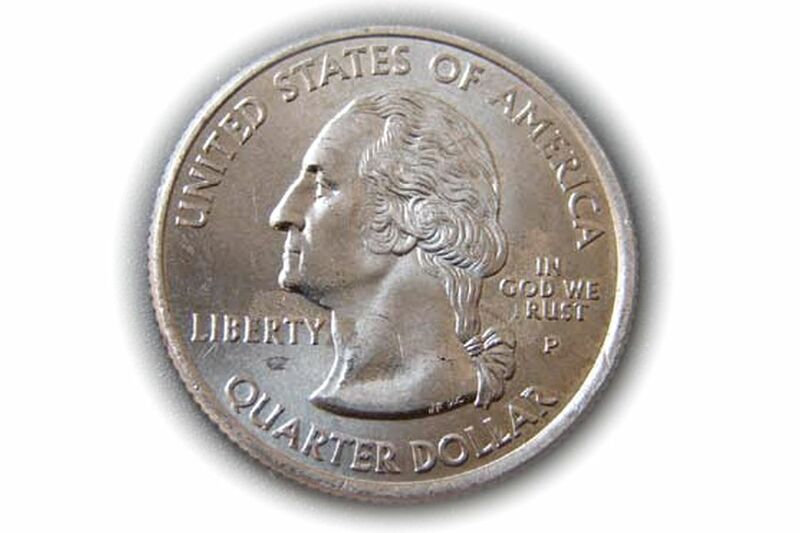 The most frequent occurrence, however, is that the grease doesn't get anywhere interesting on the coin, and simply obscures or weakens a minor area of the surface, and nobody ever notices it. How Much is the Struck Through Grease Filled Die Error Worth? As a general rule, they are not worth very much unless they are especially spectacular in some way. Then they might be valued at $2 to $5, perhaps, depending on condition. Filled die errors that occur in currently circulating coinage are not usually worth anything at all unless the coin is in an extremely high grade, generally MS-60 or better. Filled die errors on Proof coins, however, can bring a nice premium, since it is very rare that defective coins make it through the careful Proof quality-control process.